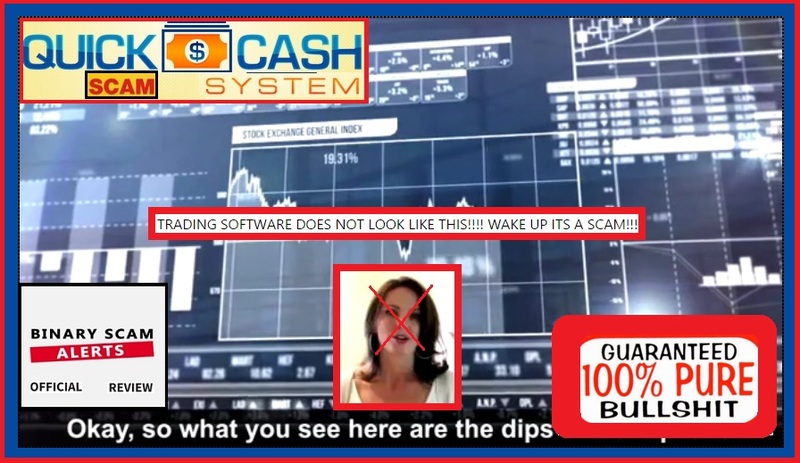 Binary Scam Alerts is posting a severe warning notice in regards to the Quick Cash System SCAM (AKA QCS Software, App, Signals, and Autotrader) as well as Sarah Markel the shameless fake mother. I must say, this paid actor is also to be held accountable, simply because she has a central role in staging a binary options investment SCAM and exposed two innocent children without any hesitation, guilt, or ill-feelings. Our staff or researchers is continuously receiving mounting complaints about this fraudulent system, and after conducting an extensive review and investigation we have decided to expose this deceptive piece of trash code through an exclusive review which will include a followup story describing how savvy internet marketers operate and what tactics they use to lure and mislead innocent day traders into their web of lies. First of all, at the lack of a better word I would call the behavior of these people appalling. It’s not enough they scam people out of their money, they have even stooped so low that they are now exploiting innocent children to lend an aura of legitimacy to their fraudulent trading software. The people behind this thing have crossed a red line and I for one am taking it personally and will make sure they pay dearly for their actions. In this first of a short series of exclusive investigative reports we will focus on how sleazy these marketers are and rebuke their so-called fool-proof system designed to make you quick cash on auto-pilot. This woman is anything but a mother, and at best she is a paid actor which is borderline agreeable in my book because people have to make a living and actors have it really hard. But this time she went too far, and here is more additional proof of scam in the image below. Offshore brokers don’t use Intuit Payroll Services. This company’s headquarters is located at 2700 Coast Ave. Mountain View CA in the USA and there is NO WAY IN HELL an offshore broker will use their services to pay US traders, or for that matter any trader. This company offers software for accountants that do payrolls for company employees and not for sending international money transfers. Feel free to check this out at the Intuit Official Website. 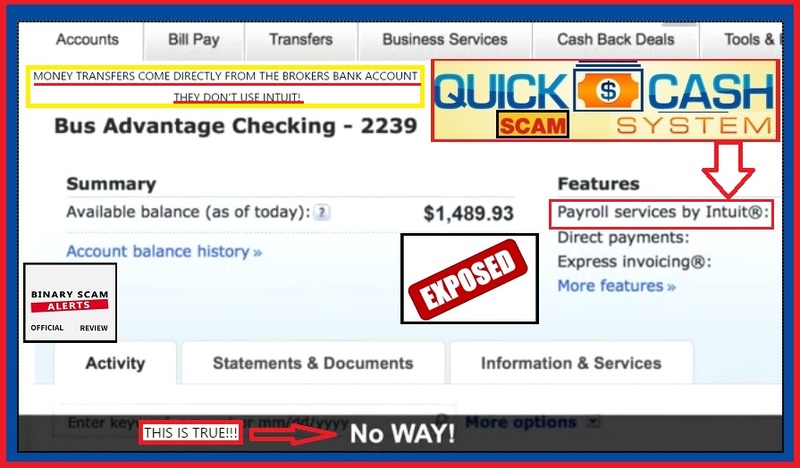 Additional proof of the quick scam can be seen when inspecting the inflated and photo-shopped bank accounts and the phony software. Real trading apps have a button that says auto or manual trading with actual signals indicating what position or contract to buy. This thing is just paid financial film footage from an image bank which looks impressive but does nothing. The actor Simon Smithson and the woman who was asked to provide her bank account details in order for the money to come in are both fakes and pretenders. Simon has no social profile on Facebook or LinkedIn, and the girl who wants to “get engaged” doesn’t even have a name, not that it matters much at this point anyways. This software is supposed to get you trading and profiting on auto-pilot mode, however the exact opposite is true. This app will intentionally take inferior trades on your behalf and very quickly and efficiently lose your money. We have tested this software and after a few quick trades we began to notice a losing trend and immediately started getting calls from a shady offshore broker who was very adamant about how his strategy works and why it’s smart to reinvest at least $1,000 to make the big money. In reality this is all a sham and the only way to win money is to manipulate the system through a series of techniques that give you an edge but this is not really “trading”, it has more to do with money management and cashing out even if you win very small amount. That is the only way to profit, so in this context all the fancy charting tools in the world will not help you one bit. You will not need candlesticks or market analysis, and the use of Bolinger Bands is futile on 60 seconds, ladder, or for that matter any contract type or size. It’s best to recognize you made a mistake, lick your wounds, and get the hell out with whatever money you have left. Sure it it, but you are required to leave $250 at the door with a broker of their choosing. These include but are not restricted to Lie Detector Millionaire, My First Online Payday, Trade X Confidential, Limitless Profits, Millionaire’s Blueprint, Trade Tracker Pro the Amissio Formula, Tauribot, Citidel, the Push Money App, Centument, Virtual Income, Insured Profits with Dave and Ginny, the Sydney System, TSI System Scam, The Lie Detector Millionaire, Binary Matrix Pro, The Free Money System with Walter Green, Binary App 810, and TrianaSoft. New trading apps are coming out every day by the dozens, and all of them promise you instant wealth at the click of a mouse. Here at Binary Scam alerts we endorse only the best systems after we examine and review them very thoroughly. The Quick Cash System (AKA QCS Software, App, Signals, and Autotrader) as well as Sarah Markel is clearly a binary options investment SCAM. There is nothing genuine, honest, legit, or sincere about this system, and if you choose to buy into this obvious sham you will end up extremely frustrated, angry, and bitter. Please use extreme caution and be super vigilant if you are approached with this offer, and if you have already funded an account with a broker do not reinvest under any circumstances and try to think of an effective way to get out with whatever money you have left in your account. We have went to great lengths to gather evidence in this review, and would love to hear your feedback. We can always be reached via our Facebook Group and YouTube Channel.